We here at FOP have tested a number of Flight Stabilizer systems, and have chosen to be the dealers for what we find are the best, the most reliable, and simple to use brands. FY31-AP is an inertial attitude measurement instrument used for automated stabilization of fixed wing model aircrafts and simple three axis camera gimbals. FY31-AP has an integrated three-axisgyro and three-axis accelerometer which controls the aircraft movement in three-dimensional space. FY-31APcontrol module incorporates an accurate barometric pressure sensor. At start up, the take-off air pressure is measured, providing the autopilot with an accurate relative height data. While the GPS module enables the autopilot to calculate the flight course and exact location of the aircraft. 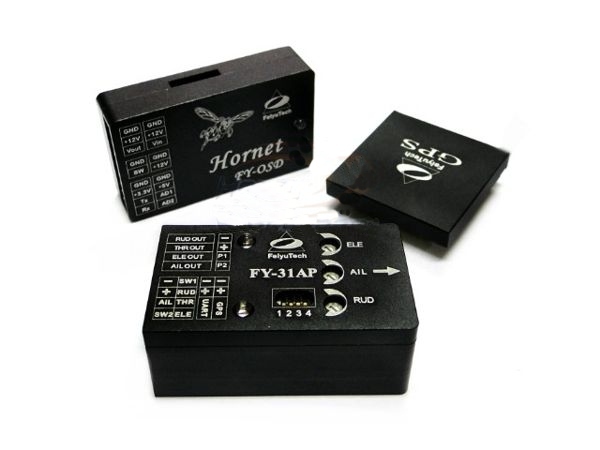 If the FY31AP is not connected GPS module, the autonomous flight system cannot be engaged and it will function purely as a flight stabilizer. • Level flight - When stabilization is activated, the FY31AP will automatically control the aircraft for smooth easy flying. For beginners in RC aircraft flying, this is advantages as it makes flight easier and increases the student pilot self-confidence. The system can be activated throughout the entire flight duration, from take off to landing. • Emergency Recovery - If you lose orientation release all control sticks, maintain throttle and switch ON the FY31AP.The unit will automatically send the correct signals to balance of the aircraft and regain level flight, giving you time to get your orientation and fly the plane back to safety. • Autonomous flight - with the GPS module the autonomous flight system of the FY31AP will enable you to fly fully autonomous, with up to 8 waypoints settings on the FY Ground Control Station software. • Ground Control Station - the FY GCS software will enable you to fly autonomously to up to 8 waypoints, display in-flight telemetry data, and record that flight for replay and analysis (this requires the optional Data Radio hardware). • Automated circling - by activating this function, the aircraft will automatically circle the selected area at a fixed altitude, the centre of the circle is the current point. You can set the circling radius, the default radius is 80 meters. • Return to Home - You can set autonomous return to home via a 3 way switch or through your failsafe setting, enabling you plane returning to home should it lose your transmitter signal. Upon reaching the home point it will automatically engage auto circling, while it waits for your further instructions. • First Person View - for long-distance RC flight via video transmitter, the FY31AP will maintain the balance of your aircraft. You only need to control the heading of your aircraft and enjoy the view. • Firmware upgrade - The FY31AP firmware is upgradable by connecting to your computer via a USB TTL cable. As Feiyu Tech continuously improves the FY31AP system, firmware upgrades will be released periodically. • First Person View (FPV) - by connecting this interface to the FY-OSD, telemetric data such as GPS, flight navigation, AHI can be displayed on your downlink video. On the other hand, it will be easier to operate FPV with the functions of automatic balance and automated return to home. • Real time telemetry - real time by-directional telemetry is monitored directly by your ground station computer. Changes to aircraft altitude and flight path can be controlled from your ground station computer. • Record and monitor your flight - you can monitor and download your flight path into your ground station computer. For more information, please refer to the FY-OSD and FY-Data Radio manual. The all new RX3S OrangeRX Flight Stabilizer V2 adds support for V-tail & Delta models, it also offers a remote ON/OFF feature that can be controlled via your transmitter's AUX channel. All of these great new features yet it's even smaller/lighter than the original! 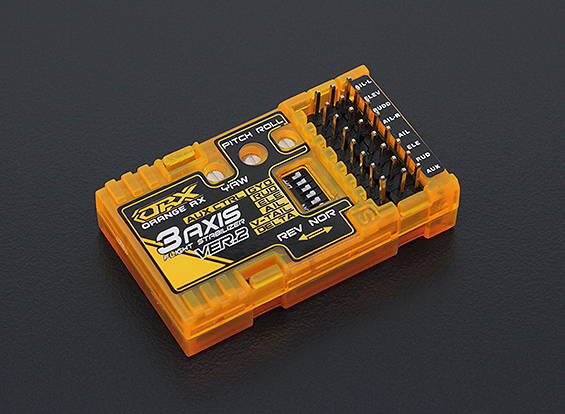 Utilizing a single high precision 3-axis MEMS gyro, the RX3S OrangeRX Flight Stabilizer V2 is capable of stabilizing flight on just about any fixed wing aircraft! It provides added stability by automatically correcting the aileron, elevator and rudder channels in flight. This compensates for unwanted changes in the airplane's attitude due to wind and other factors. In short, it makes your airplane much more stable in flight! The RX3S V2 is great for those who tend to fly in windy conditions, as it will compensate for wind gusts that would normally push your model around. It's also an ideal add-on to your favorite FPV model to keep it on the straight and level while flying. This unit is very simple to install and use. The adjustable gain settings are pre-set to 50% offering mild stabilization. You can easily adjust the gain for each channel as desired to increase or decrease the compensation for the respective channel (AIL, ELE, RUD). Because we design, test and manufacture these units completely in-house (from 3D/2D drawing to materials sourcing, final assembly etc.) we can completely control production and ensure product consistency from design right through to shipping the product to you. Also, the removal of middle-men has meant we can drive better value to the market and retail these units at factory(our) prices!